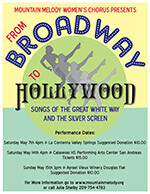 Familiar favorites from the stage and screen spring to life through the beautiful harmonies of Mountain Melody Women's Chorus as they present their spring concert series, "From Broadway to Hollywood: Songs of the Great White Way and the Silver Screen." Entertaining costumes, props and a little bit of dancing spice up melodious voices for a perfect night of family fun. From "South Pacific," we have "I'm Gonna Wash That Man Right Outa My Hair," from "The Sound of Music," the yodel-rific tune, "The Lonely Goatherd," and the beautiful and haunting "The Music of the Night" from "The Phantom of the Opera." These infectious tunes will have you singing along during our three shows on May 7, 14 and 15. We also are thrilled to be inaugurating the new Calaveras High School Performing Arts Center. So come join us as we conjure the magic of the boards of Broadway and the sensation of the celluloid of Hollywood through song.